Along the Athenian coast we go, revelling in stunning views and ancient stories of Greek mythology. At the tip of the coast, the ancient Temple of Poseidon awaits, where the sunset will leave you spellbound. Are you thinking of escaping the bustle of Athens for a few hours or even a whole day? Let us take you on an unforgettable trip to Cape Sounio! Get ready to feel the unique vibe the Temple of the God Poseidon gives off, while enjoying a magnificent multi-hued sunset and a panoramic view of the sea. This tour will leave you with delightful images engraved in your memory. If you choose so, you can also stop and enjoy the healing properties of a natural spa in Vouliagmeni lake along your way to Sounio. Visit the Temple of Poseidon and get ready to discover fascinating facts and myths about the outstanding monument. Ideal for couples! Get inspired by romantic views and heart-melting sunsets! A superb experience for families! Your fun & knowledgeable guide will entertain your little ones with amazing stories from the Greek Mythology. My friend and I wanted to do a last minute trip to Sounio and the Temple of Poseidon before we left the next day back to Los Angeles. Greeking.me was able to book us an amazing private tour down the coast to the temple. It was perfect timing to catch the sun setting. Everything was perfect! Thank you! We booked four tours with Greeking.me [Night tour, Foodies, Acropolis and Cape Sounion]. All four guides were super,professional, knowledgeable, interesting and fun. Nikos, the owner of Greeking.me, is quick to respond and eager to help you have an unforgettable visit to Athens. We were a group of 10, who booked 2 one day tours to get an introduction to Greece and Athens. We couldn't have been happier. First, Anna and Nikos, spent a considerable amount of time helping me develop an itinerary that would give us a good balance of the "must see" sites with a taste of what life is like for local Athenians. The end result was enjoyable, comprehensive and very reasonably priced. What a great time we had in Greece! I wanted to take a moment to thank you very much for how easy it was to book our 2 trips with you. Both of them were fantastic! Our driver Andrew, was amazing. He was kind, polite, and very thoughtful. Although he wasn’t a tour guide, he was able to answer some of our general questions about the country, etc. The trip to Sounio was a repeat of Delphi, wonderful weather, wonderful drive through the countryside and a great destination to explore. Andrew once a gain was fantastic. He is a wonderful driver and a great representative of Greeking Me. 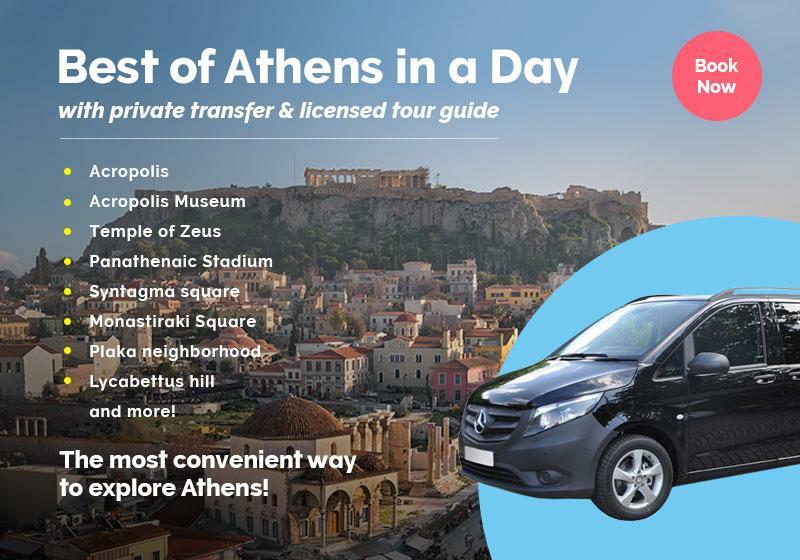 Our journey kicks off early in the evening so you can catch the magnificent colouring of the sky, while you soak up the scenic views of the Athens Riviera on our way to cape Sounio. You will also get to gaze over the Doric-column Temple of Poseidon settled on the top of a craggy coast hill, overlooking the blue hues of the Saronic Gulf and the Aegean Sea; follow the clues of Lord Byron and meander around the same place where King Aegeus led the days of his life. During the summer months, stop en route to the beach just below the temple of Poseidon and give in to an hour of relaxation in the refreshing waters of the Aegean Sea. Enjoy the sun and the sea, while having some cool refreshments that will energise you enough to ascend to the top of the hill of Poseidon, the southernmost point of Attica. In winter, since the temperatures do not allow a dip into the waters of Sounio, you will have the chance to pay an hour-long visit to the Stavros Niarchos Foundation Cultural Center (SNFCC), a newly-built complex located at the grounds of Phalero. An example of modern architecture, the SNFCC combines its minimalist aesthetic with the natural landscape and exploits the temperate climate and seasonality of Attica. Wander around the award-winning Mediterranean Garden of the Cultural Center and head to the Pharos, where you can gaze at the expanse of the Aegean Sea. Have a look in the National Library of Greece or the impressive National Opera House, and relax with a cup of a hot beverage along with some snacks by the canal of the SNFCC. The construction of the Temple of Poseidon started in 444 BC and was completed in only 4 years. This all-marble temple was the epicentre of Poseidon's cult, with his colossal bronze statue of over 20 ft. laying inside the structure. On the site, the Athenians put forward as a votive offering a whole Persian trireme that was captured after the naval battle of Salamis. The temple was decorated with a frieze, which these days is so fragmented that scholars do not agree on what its iconography used to depict. The most prevalent view, suggests that it used to portray scenes from Centauromachy, Gigantomachy, and some of the famous deeds of Theseus,the mythical king and founder-hero of Athens. This new Cultural Center is located at the shores of Phaleron, the second harbour of Attica. A donation of the Niarchos Foundation, this complex host the new National Library and the National Opera House. The Center combines the simple lines of modern architecture with the natural landscape of Phaleron. Exploiting the natural resources of the area, the building offers a unique experience to the visitor. Its construction took many years, due to the wealth of archaeological finds that were unearthed on the site. The most well-known is the extended burial site of Phaleron, which gave to the world artefacts and information that clarified, even more, our perception of the Classical civilisation. On the grounds of the SNFCC, the visitor has the chance to visit the National Library of Greece, a colossal project that moved the national literature treasure from the centre of the city to this new facility. Admire the Tower of the Books and have a glimpse of the National Opera House located right next to it. An ideal place for a coffee-break, brunch or lunch, the Canal or the Garden at the SNFCC will make you forget you are in the middle of the bustling city of Athens! Your personal set of sunbeds and beach umbrella to enjoy your small break at Sounio beach. You can select either an un-guided Sounio trip with a professional driver or a guided Sounio Trip & Temple of Poseidon Tour with an excellent licensed guide. Tours are offered in English, Spanish, German & French. Prepare yourself for an exciting experience & bring along your camera so you can capture the best moments of your trip. A pick-up from your hotel is included in this private experience. Please send us an inquiry. Very much! Your expert guide will provide fascinating info & easy to understand stories about Sounio and the Temple of Poseidon, that will make this tour an unforgettable experience for your little ones! Fortunately the weather in Greece is mild and warm for most of the year. In case of rain, though, you will be timely notified about any changes to your scheduled tour. The "Sounio & Temple of Poseidon Tour" is available as a private tour, in order to further customize your experience to fulfill your specific needs & expectations. Simply tell us your preferences in the booking form below.